Perhaps for this reason, we are now seeing very large groups moving into this space or seriously considering this approach. Say what you will about RBP (and many critics do) – but in many cases, it has (at least) been shown to actually save money – whereas complex, flashy and mainstream initiatives like Accountable Care Organizations (ACO) are reportedly not faring well (overall).3 As we migrate from volume to value-based models (away from fee-for-service), health systems with a 30 year dependency on volume are struggling to reduce utilization and the unit costs of care. a recent surge in the market that uses only a percentage of the Medicare rate (or its equivalent) for all claims, shifting from HRBP to MRBP. TOP value of the services rendered. In the case of Children’s Hosp. Cent. Cal. v. Blue Cross of Cal. (226 Cal. App. 4th 1260),13 the court overturned a lower court’s ruling that would allow a hospital to argue that what is reasonable and customary – and payable – to a hospital is not limited to the facility’s billed charges and rather, the “value” of the service is determined by examining all rates that are the result of contract or negotiation, including rates paid by government payors. Further, there is IRC § 501(r):14 when Section 501(c)(3) applies to a facility, upon billing self-pay patients directly, the law requires providers to not “engage in extraordinary collection actions before making reasonable efforts to determine whether the individual is eligible for... financial assistance... .” The law explicitly prohibits the use of gross charges. Providers may only bill the qualified self-pay patient at the “best” (meaning lowest) negotiated commercial rate, average of the three “best” (lowest) negotiated commercial rates, or the applicable Medicare payable rate. The subtleties of Section 501(r) cannot be overlooked. If a patient has insurance, the patient’s liability is the billed charges and whatever “discount contract” the insurer may have; if a patient does not have insurance, the patient’s liability is a reduced or fair market value-based rate, but only via the financial assistance policy. When will this bubble pop? to accept (e.g., charges or a meaningless discount off random charges). If you ever speak or have ever spoken to providers about Medicare rates, you know that they will be quick to tell you that Medicare “does not cover costs.” This is supported by the American Hospital Association (AHA) Underpayment by Medicare and Medicaid Fact Sheet: • Medicare and Medicaid account for 58% of all call offered by hospitals; • 85% of Hospitals participate despite the fact that doing so is voluntary (i.e., non-obligatory); • Medicare pays for only 88% of costs; • Medicaid pays for only 90% of costs; • 65% of hospitals reported that Medicare payments were less than cost (the other 35% of hospitals reported that Medicare covered their costs); and, • 62% of hospitals reported that Medicaid payment were less than cost (in other words, 38% of hospitals reported that Medicaid covered their costs).15 To be clear, 35-38% of hospitals have their costs covered by Medicare and Medicaid; the rest do not at varying levels. On that point, I would like to remind people that nearly one-third of healthcare is waste,16 so one could argue that if hospitals removed their share of the waste; Medicare would likely cover more reported costs and then some, wouldn’t it? Either way, MRBP plans pay Medicare plus a percentage. Though RBP payments may represent a shortfall from typical reimbursements; the payment is meant to pay a reasonable profit above responsible use of resources. MOOP, the Willing Provider and You! The Department of Labor (DOL) has explained (see FAQ XXI)17 that amounts applied to an individual’s out-of-pocket maximum do not (but may, at the plan’s option) include “premiums, balance billing amounts for nonnetwork providers, or spending for non-covered services.” Confusion has since arisen regarding the FAQ, which presented “parameters” (like network adequacy) that must be met by RBP plans before this can apply. In other words, charges not covered by the RBP plan will not apply to the patient’s maximum out of pockets (MOOP), if the qualifications are met. It seems obvious that only LRBP plans were considered. Some read the FAQ as requiring plans to have (adequate) networks in place, while others read it to mean that only if you have a network, must it be adequate. According to some, plans with no network whatsoever are immune to the adequacy rules. It appears we have lived with networks for so long that this market and the Department of Labor, cannot conceive an environment where payer simply does not use network. Healthcare providers all want volume; they want “steerage.” In contrast, payers want to encourage members to obtain the necessary services from a low-cost, high-quality facility – and hospitals have been known to sue if they are excluded from a network under “any willing provider” laws.18 In this context, providers want the patients to have the right to choose and choose them (and providers spend a fortune in direct to consumer marketing). “Any willing provider” laws allow any provider that meets a plan’s standards and agrees to the plan’s terms to become one of the Plan’s preferred providers. RBP plans address “any willing provider” concerns by nullifying them and the plan can actually save money in the process. It’s a beautiful thing. number of people in the industry that are somehow equating the term “fiduciary” with protection of patients from balance billing. In response to that let me summon my inner Bob Newhart in emphatically saying “STOP IT!” In the RBP context, fiduciary responsibility means paying claims according to the fixed fee schedule explicitly stated in the plan document. If Plan Administrators do that, they have fulfilled their fiduciary duty and can defend themselves from those who would challenge this. Balance billing is the responsibility of the member. While the plan may choose to step in and help protect the member by settling claims (and I think they should), strictly speaking, the plan has no fiduciary or equitable obligation to do so. Oddly, we have seen many RBP plans absolutely refuse to negotiate claims with providers and openly opine that all claims need to go to collections before settlement can ensue. In general, I disagree with that approach. External collections can add a difficult layer of liability: additional cost. Once external collections are in play, providers net less money on any settlement. They now want more to cover those costs; more than they may have previously been inclined to offer a payer, because they now need to pay the collector (typically 20-35%). Plus, outside parties have their own interests, which therefore look to compromise budding positive conversations between payers and providers. Remember, collectors (and RBP vendors too to a large extent) make money from disagreement in this market. In many instances, a complete lack of flexibility in strategic settlements can galvanize a regional provider community to “gang up” and reject an RBP Plan. We have witnessed state hospital associations actively campaign against certain vendors, educating their membership on how to fight or even eliminate RBP plans. This can involve en masse pursuing the patient for payment or even pushing away patients for non-emergent care (aka “black balling”), which can damage the viability of an RBP program (and potentially all RBP programs). That is not to say that being inflexible cannot work at times; in some cases, rigidity has value and the trick is to be watchful and thoughtful about what is happening in the provider community context. For this reason, we recommend open strategy discussions between all parties involved in the RBP program, which typically involves input from TPAs, vendors and the plan sponsor. A mere subtlety in market dynamics or a key relationship can make all the difference between success and failure. In other words, the ideal RBP program is a customized one, tailored to the needs of a given client in a given situation. This is where many vendors show their true colors – whether in a positive or negative light. patient, but also can help safeguard stop-loss reimbursement. another) being consumed. Is this too simple or blunt an approach? At the end of the day, we are well served to recall the 2003 article from Gerard Anderson, Professor at Johns Hopkins Bloomberg School of Public Health, about the real problem in US healthcare: It’s the Prices, Stupid: Why the United States is so different from other countries. Jason C. Davis is Business and Product Development Consultant at The Phia Group. He specializes in medical claim review/negotiations and cost-containment program development including vendor, network and provider contracting. With the goal of combating the steadily increasing costs, Jason routinely consults The Phia Group’s industry-leading attorneys on complex claims provider negotiations, payment disputes and balance billing management. Before joining The Phia Group, Jason was a key member of another cost-containment ﬁrm, holding positions in claim negotiations, cost-containment R&D, business development, and upper management. hen Congress delayed implementation of the Affordable Care Act’s (ACA) “Cadillac Tax” on high-value employee beneﬁt plans from 2018 to 2020, it pushed further into the future the draconian tax’s damaging effects on self-insured beneﬁt plans and the nation’s economy. Bob Shupe, a member of the GRC and CEO of ESP, LLC, a health plan management company in Brentwood, Tennessee, said that the tax on some employee health plans would be a disaster for employers sponsoring self-insured plans whenever it may be implemented. ECHO is the leading provider of electronic healthcare payment solutions, serving over 50,000 ERISA health plans and fully insured groups through a single secure ERISA, HIPAA and CORE compliant system. SIIA’s formal support of Cadillac Tax repeal was established. “Our discussion focused on who really wanted this tax,” he recalled. “It is opposed by business and employee organizations across the political and economic spectrum. 250 or more forms must be done by June 30 rather than March 31; and paper or electronic filing of the 2015 Form 1094-C (for fewer than 250 forms) must be done by May 31 rather than February 28. ■ Further information of these and other issues of federal legislation or regulation remain available by contacting Ryan Work in SIIA’s Washington ofﬁce at rwork@siia.org or (202) 595-0642. YOUR ANSWER TO HEALTHCARE SAVINGS H.H.C. Group is a full-service health insurance consulting organization that alleviates the effects of rising healthcare costs for insurance payors by providing appropriate and reasonable prices through innovative services and customized solutions. ome of the air went out of the Maryland Insurance Administration’s (MIA) current study on stop-loss insurance for sponsors of selfinsured employee beneﬁt plans when Congress passed the PACE act last year that revised the ACA to allow states to continue deﬁning small employers at 50 head count. future impact on self-insured plans in Maryland while potentially diminishing the purposefulness of the study. A final report is scheduled to be delivered to legislative committees in October. “When I read the report I wondered why they didn’t just stop the process right there,” said SIIA member Rodger Bayne, CEO of Benefit Indemnity Corp. of Towson, Maryland. That statement seems to preclude the need for further consideration of stop-loss insurance by Maryland lawmakers and regulators but the rule, that once a government bureaucratic process is launched it must be completed, appears to be in force. as a vital part of self-insurance. The report recounted how thoroughly MIA mined for information about small group self-insured benefit plans in establishing the parameters of its survey. MIA held a series of town meetings around the state and an informational hearing last September (reported in the November issue of The Self-Insurer). “The longer our industry goes without challenging government intervention, the state becomes more comfortable with the idea of regulating self-funded plans by attaching regulations to stop-loss insurance.” Bayne believes that Maryland and other states can or even have edged into regulating selfinsurance, which is overtly denied by the federal ERISA law, by regulating the level of risk employers accept (stop-loss attachment points) and the size of self-insured groups. The MIA’s appetite for data appears not yet satisfied as its report indicates that further information will be invited in a 2016, “data call letter” to be sent to carriers participating in the Maryland small group market. Presumably “carriers” includes stoploss insurers as well as traditional group health insurers. 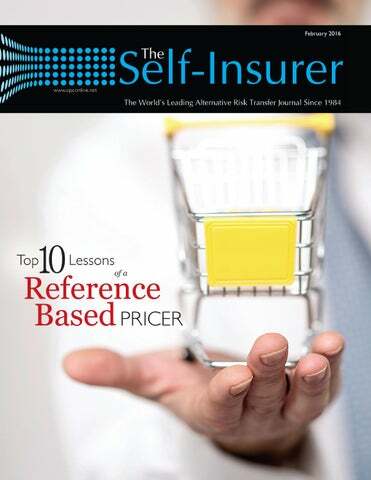 “It’s up to people engaged in selfinsurance to initiate their responses,” Bayne said. “SIIA is working hard along with the Maryland Association of Health Underwriters to support the stop-loss market. remind state government about that precedent,” he said. ince the Liability Risk Retention Act (LRRA) was signed into law nearly thirty years ago, the industry has been attempting to get the law amended, with the most recent attempts centering on property coverage. As it stands, the LRRA allows risk retention groups (RRGs) and risk purchasing groups (RPGs) to insure liability only. Legislation introduced into Congress last October is the most recent effort to amend the LRRA, but it is meeting with opposition from some industry supporters. The Nonprofit Protection Act (NPPA), H.R. 3794, introduced by Congressman Dennis Ross (R-FL) and Congressman Ed Perlmutter (D-CO), would allow a small subset of RRGs the opportunity to provide property insurance to its members. The bill, spearheaded by Pamela E. Davis, the founder, president and CEO of Nonprofits Insurance Alliance Group which manages Alliance of Nonprofits for Insurance, Risk Retention Group, would allow for certain RRGs that provide coverage for nonprofits to write property coverage. the law have centered on enabling RRGs to write property for their members. Since 2010, proposed legislation has also included creating a dispute resolution process for RRGs and addressing corporate governance concerns. While the continual efforts of the risk retention industry have resulted in several bills introduced into both the House of Representatives and the Senate, none of the bills have made it to the floor for a full vote. Previous efforts to amend the law intended all RRGs the opportunity to offer property, NPPA will only apply to RRGs whose members are 501(c)(3) nonprofits. The pool of RRGs that qualify to offer property would be further reduced by several stipulations in the bill. A RRG must also have been in operation for at least ten years and have surplus of at least $10 million. The total insured value of risks covered by additional forms of commercial insurance would be capped at $50 million for any one member of the RRG. If NPPA is passed the law would apply to an estimated six RRGs out of more than 230 currently operating groups. “Any bill in Congress is a long shot,” said Davis. “However, I have been pleasantly surprised with the reception we have had, especially the past six months. I believe that our message is starting to get traction. We are not asking for any handouts from Congress, only the ability for small and mid-sized nonprofits to pool their resources to jointly provide a type of coverage that the traditional insurance market simply is not providing.” ■ Karrie Hyatt is a freelance writer who has been involved in the captive industry for more than ten years. More information about her work can be found at: www.karriehyatt.com. Outlook There has been no movement on the bill since it was referred to the House Committee on Financial Services in late October. As 2016 is an election year, bills will be much harder to get passed. While NPPA has some positive backing, those against it will be lobbying hard to keep it from being passed. REINING IN UNIQUE RISKS | FEATURE They’re also typically owned by small or privately held enterprises rather than big, publicly held companies. In contrast, a medical stop-loss captive or workers’ comp captive is designed to simply help manage the cost of a commercial insurance program. has been made since a legislative proposal made in February 2015 that could have been disastrous for the captive industry. “SIIA has really stepped up to the plate in terms of our protection and advocacy for the ERC industry,” he reports. That effort includes educating policymakers and members of Congress about what 831(b) captives mean, especially to small and midsize businesses and their ability to mitigate unique risks such as cyber security or wind damage. Simpson believes the relative newness and mounting popularity of captives may explain why they landed on the IRS’s infamous “dirty dozen” list of tax scams and are prone to misconception or suspicion of ulterior motives. “The IRS hates captives, always has,” he says. Regulators, on the other hand, in large part appreciate and generally understand captives, he adds, though there are still a fair number of them who are skeptical or misinformed. Filling a Void Whatever happens with respect to government oversight in the months and years ahead is anyone’s guess, but there’s no doubt that ERCs fill a void in the marketplace. They’re essentially alternative risk insurance companies that insure unique risks that are not covered in traditional market policies, explained Mike O’Malley, managing director of Strategic Risk Solutions, Inc., during a panel discussion at SIIA’s recent national conference. They not only complement other types of coverage, but also offer protection against unusual or rare sets of circumstances based on a very different set of actuarial methods and assumptions, noted Rob Walling, a principal and consulting actuary with Pinnacle Actuarial Resources, Inc.
says Jeff Simpson, an attorney with Gordon, Fournaris & Mammarella, P.A. who chairs SIIA’s Alternative Risk Transfer Committee. It’s seen as particularly useful for small and midsize employers. He cited two client examples. One involved product contamination and recall coverage purchased for a consumer food producer that experienced three large claims over an eight-year span. These claims fell under the policy exclusions and created material financial volatility. Another case involved a computer software developer that purchased cyber liability that expanded software use to a handheld sales environment, including personal information. The tie-in to self-insurance is that many captives mitigate against stoploss risk, according to Ryan Work, SIIA’s VP of government relations. “Those kinds of conversations are nontraditional, to say the least, but they require a dialogue between the insured and captive at a bare minimum to understand what the real problem is and what the risk is,” he said. The educational workshop – “Enterprise Risk Captives: How does the Insurance Actually Work?” – examined the inner-workings of ERCs and what makes them unique. Simpson acted as moderator and deftly fielded questions throughout the session. coverage positions under the same policy language for all claims that trigger the coverage. With regard to claims adjusting, Sheridan stated that proper claim documentation is at the center of effective adjusting. Claims adjusting generally involves investigating claims and documenting the coverage evaluation, as well as setting and documenting reserves, she added. Questions to Ask In looking at the big picture, O’Malley suggested there are several meaningful questions to ask when considering an ERC and assessing risk. They include the following: – What are the major risks that impact long-term viability of the operations? – What controls are currently in place to manage these risks? – How effective are the controls in place? REINING IN UNIQUE RISKS | FEATURE As part of that process, he said it’s critical to conduct a risk assessment to identify potential hazards and analyze what could happen if a hazard occurs. In addition, a business impact analysis will help determine the potential impacts resulting from the interruption of time-sensitive or critical business processes. The risk-assessment process involves several major steps that identify or assess relevant business objectives, events that could affect the achievement of objectives and risk tolerance, as well as both the inherent and residual likelihood and impact of risks in those two scenarios. It’s also important to evaluate the portfolio of risks and determine risk responses – and as such, consider the captive approach as one of several options to help control cost. Another key theme involved the risk-sharing terms associated with risk distribution. There must be sufficient exposure units and the involvement of many insured individuals, while one test occasionally used is that an insured not pay its own losses. Each member of the ERC shares its respective risk and exposure and in return, receives the benefits of “pool risk,” which O’Malley noted evenly distributes the risk and is “the foundation of insurance in general.” The panel also discussed risk shifting, citing Revenue Ruling 2002-91. It was noted that any financial loss by the insured is offset by an insurance payment after some or all of the financial consequences of the potential loss is transferred to the carrier. Any prospective ERC customers should be on their guard when assessing this arrangement, according to O’Malley, whose parting words were: “If it’s too good to be true, it’s too good to be true.” He suggested a strong need to closely consider the fact pattern of the entity and follow fundamental core concepts such as arm’s length pricing, limited rollback and premiums being paid on time. Although ERCs represent an alternative to traditional insurance, the arrangements still must adhere to basic principles to pass muster with industry regulators and draw customers. “Insurance companies need to act like insurance companies and captive insurance companies are no different,” Walling opined. That means posting reserves for unpaid claims, producing income statements, conducting rigorous reviews, ensuring that the captive’s capitalization is reasonable after dividends are paid and the funds available to pay claims are unimpaired after a runback. ■ Bruce Shutan is a Los Angeles freelance writer who has closely covered the employee beneﬁts industry for 28 years. ave you ever attended a NASCAR race? We’re not asking if you’ve ever watched a race on TV, but whether you have actually ever attended a race. Unlike TV, with the beneﬁt of many camera angles and varied vantage points, you can’t simply watch the cars go leisurely around the track when watching live. There are so many cars going so fast that you have to focus on a single car directly in front of you and stay focused on that one car and only that car, as it speeds down the front straightway. Otherwise, all you see is blur – total blur. Lately, it has felt like monitoring legislative and regulatory activity related to health and welfare benefits is similar to watching a NASCAR race live. There are so many rules and regulations coming out and they come out so fast, that if you don’t focus on each rule or regulation as it passes by you, then all you see is a blur. Unfortunately, if you are reading this, you are already an active participant in the race and charged with knowing all of the rules and regulations that impact your plans and/or your clients’ plans. This is why we do this “year in review” each year – so that you can better see all the cars on the compliance track and hopefully avoid a year-end crash. In 2015, there was so much activity – legislation, regulations, Supreme Court cases, FAQs and other subregulatory guidance – that we aren’t able to cover everything. We do, however, hit the high points of 2015. Final Health Insurance Reform Regulations In November, the Department of Labor (DOL), Department of the Treasury and Department of Health and Human Services (HHS) issued final, final tri-agency health insurance reform regulations. The final regulations, which are applicable for plan years beginning on or after January 1, 2017, combine the interim final regulations issued during the first few years after the health insurance reforms became effective and the subregulatory guidance (e.g., the FAQs posted on the agencies’ websites) subsequently issued by the agencies without significant changes or clarifications; however, there are a few clarifications worth noting. Grandfather Plan Status If applicable, grandfathered status enables plans to avoid some, but not all, of the ACA insurance reform provisions. The regulations clarified the following: • A loss of grandfather plan status that occurs during a plan year due to a decrease in the employer’s share of the total cost of a fully insured plan is not effective until the start of the next renewal date (as opposed to the effective date of the change) so long as the employer warranted grandfather plan status at the time of the prior renewal. • Adding new contributing employers to a multiemployer health plan does not, in and of itself, cause the multiemployer plan to lose grandfather plan status. The regulations fail to address a few open issues related to grandfather status, including the potential impact that a wellness program premium surcharge has on grandfather plan status or, for purposes of losing grandfather status due to a coverage reduction, when benefits necessary to treat or diagnose a condition have been substantially eliminated. Year End Update : As addressed in our separate advisory (www.alston.com/ advisories/year-end-employeebenefits/), the PATH Act, which was signed into law December 18, provides for a two-year delay of the 4980I tax (the so-called “Cadillac Plan” tax), making its start date 2020 and makes the tax deductible. The thresholds will continue to be adjusted for inflation during this period. The legislation also provides for permanent parity for transit benefits retroactive for 2015. Also, the IRS issued comprehensive guidance in Notice 2015-87 that addresses health reimbursement accounts (HRAs) and cafeteria plans and Notice 2013-54; affordability, creditable hours and other issues under 4980H; and certain compliance issues associated with flexible spending account (FSA) carryovers, including COBRA. IRS Notice 2015-87 will be the subject of a forthcoming article. Rescissions • Voluntary retroactive terminations are not rescissions. Thus, if an employee erroneously enrolls in a group health plan and wishes to retroactively undo that enrollment, the plan may allow that (subject, of course, to any Code Section 125 restrictions) even in the absence of fraud or failure to pay the applicable premiums. • For plans subject to the federal external review process (e.g., self-funded ERISA plans), the final regulations make permanent the limitation on external review of benefit claims to those adverse benefit determinations that the independent, external reviewer determines involve medical judgment and rescissions. • In addition, the final regulations add two more to the list of claims subject to external review: » Whether an individual is entitled to an alternative standard under a wellness program due to a medical condition. » Whether the plan satisfies the nonquantitative treatment limitation requirements of the Mental Health Parity and Addiction Equity Act. Prohibition Against Annual Dollar Limits on Essential Health Benefits • Self-funded plans may use any of the effective State or Federal Employees Health Benefit Plan benchmark plans to determine which of its benefits qualify as “essential health benefits.” Prior guidance indicated that any of the plans that could have been adopted as a benchmark (whether adopted by a state as a benchmark or not) could have been selected. medical expense reimbursement plans (MERPs). This clarification was needed because Public Health Service Act Section 2711 contains an exclusion only for integrated HRAs, which technically require a carryover. • In an expansion of the relief in Notice 2015-17, these regulations indicate that an employer with fewer than 20 employees that offers coverage to non-Medicare eligible employees but does not offer coverage to Medicare eligible employees may still reimburse a Medicare eligible employee’s premiums. • In order to allow group health plan participants to be eligible for an exchange subsidy, Notice 201354 indicated that to be integrated, HRA funds must be forfeited upon termination or the participant must be permitted to opt out and waive reimbursements. It was unclear whether any such waiver was permanent under Notice 2013-54. These regulations clarify that the waiver is effective even if the reimbursements can be reinstated at a later date (e.g., the start of the next plan year or death or the earlier of the two) so long as the waiver is irrevocable prior to the occurrence of the reinstatement event. Patient Protections • Plans may impose reasonable geographic limitations on primary care physicians who may be chosen by a participant; however, they do not define reasonable geographic limitations. Proposed Disability Plan Claims Procedures On the same day that the agencies issued the final health insurance reform regulations, the DOL issued proposed claims procedure rules applicable to disability plans. The proposed rules would incorporate into ERISA’s claims procedure rules the following requirements previously made applicable to group health plans by the ACA: • Rescissions of disability benefits not triggered by a claim (e.g., through an audit) are considered adverse benefit determinations. • Letters must be available in a culturally and linguistically appropriate language. • If new evidence is relied on during appeal, the plan must provide the claimant with the new evidence prior to the due date of the determination and the claimant must be provided a reasonable opportunity to respond. c a r r i e r s a n d i n n ovato r s c a r r i e r s a n d i n n ovato r s We Build and distriBute selF-Funded plans, products and ideas. We Build distriBute plans, products and ideas. Bringand us your product, selF-Funded your innovation, your ideas, your needs, Bring us your product, your innovation, your ideas, your needs, and we’ll build you a solution or application and put it into distribution. and we’ll build you a solution or application and put it into distribution. • Claimants can forgo the internal appeal process if the plan fails to follow a full and fair review process, as set forth in Section 503 (and the regulations), unless those failures are minor. EEOC Proposed Wellness Program Rules Under the ADA and GINA Not to be outdone by the agencies, the Equal Employment Opportunity Commission (EEOC) issued proposed regulations in 2015 that attempt to clarify the application of the Americans with Disability Act (ADA) and the Genetic Information Nondiscrimination Act (GINA) to wellness programs. These proposed regulations were the subject of our prior Self-Insurer articles. King v. Burwell In a 6-3 decision written by Justice Roberts, the Court held that premium tax credits and advance premium subsidies were available to individuals enrolled in policies issued by federally run exchanges. Had the Court held that they weren’t available, then exchange participants in a majority of states would have lost their premium subsidies/tax credits. For employers, a different decision would have lessened the impact of the ACA’s employer-shared responsibility provisions (i.e., the IRC 4980H so-called “pay or play” provisions) on “applicable large employers,” especially employers with most if not all of their employees in states with federally run exchanges. M&G Polymers v. Tackett In a 9-0 decision written by Justice Thomas, the Court held that you cannot infer an intent by parties to a collective bargaining agreement to vest retiree health benefits merely because a termination provision is absent in the collective bargaining agreement, reversing the inferences created by the Sixth Circuit’s decision in Yard-Man (716 F.2d 1476). ACA Reporting After several draft forms and instructions, the IRS issued 2015 final instructions and draft 2015 Forms 1094 and 1095 B and C series to be used in connection with reporting required under Code Sections 6055 and 6056. The final instructions contained a few clarifications and changes from previous instructions and guidance. of a controlled group that each participate in a single self-insured plan but are not also applicable large employers may designate a single employer to file on behalf of all employers. â&#x20AC;˘ An applicable large employer that maintains a self-insured plan that provides minimum essential coverage must satisfy its Section 6055 obligation for any individual employed at any time during the year. Such employers may use a C-Series form to satisfy the Code Section 6055 reporting obligation for non-employees (e.g., a former employee whose termination of employment occurred last year) so long as they have the social security number of the responsible individual (typically the individual who has the enrollment right under the plan). â&#x20AC;˘ Employers that maintain a self-insured plan (such as an HRA), the eligibility of which is conditioned on being enrolled in other minimum essential coverage, have no Code Section 6055 reporting obligation for that selfinsured plan coverage. If eligibility is conditioned on being enrolled in another employer plan, then the exception from reporting applies only if the other coverage is maintained by the same employer. Code Section 6056 • Applicable large employers that contribute to multiemployer plans need not report offers of coverage or enrollment in the plan by an employee who is full time at least one month during the year if the employer is taking advantage of the multiemployer transition relief from Code Section 4980H excise taxes. In other words, employers report no offer of coverage – even if coverage is actually offered by the multiemployer plan – for each month that the employer is also indicating that it made a contribution that month to the plan for that employee. • Applicable large employers also report no offer of coverage for former employees offered COBRA coverage, even though COBRA was offered. There is still much confusion regarding the rules for reporting offers of COBRA coverage to active employees. The instructions prescribe a somewhat ambiguous rule and even though FAQs issued shortly after the final instructions were issued provide a clear and concise rule (with examples), IRS officials have informally indicated that the FAQs need to be updated. • Self-insured dental and vision plans that qualify as excepted benefits (under final agency regulations) would likely be excluded from the definition of applicable employer-sponsored coverage (the statute only literally excludes fully insured dental and vision benefits). This provides an exception for most standalone vision and dental plans, including limited purpose vision/dental HRAs. • Employee assistance plans that qualify as excepted benefits would also likely be excluded from the definition of applicable employer-sponsored coverage. • Health FSAs are not excluded and neither are employer and employee pre-tax HSA contributions (although much effort is underway to get them excluded). As addressed in our separate advisory,1 the PATH Act, which was signed into law December 18, provides for a two-year delay of the 4980I tax (the so-called “Cadillac tax”), making its start date 2020 and makes the tax deductible. The thresholds will continue to be adjusted for inflation during this period. voucher that is readily available in an area is a terminal restricted card, cash reimbursement will no longer be available. As addressed in our separate advisory, the PATH Act, which was signed into law December 18, provides for permanent parity for transit benefits retroactive for 2015. • Cafeteria plans that implemented the new election changes prescribed by Notice 2014-55 in 2014, have until December 31, 2015, to retroactively amend the cafeteria plan. he Self-Insured Health Plan Executive Forum is March 21-23, 2016, at The Westin New Orleans Canal Place in New Orleans, Louisiana. Executives involved with the establishment, management and/or support of selfinsured group health plans will ﬁnd this educational conference exceptionally valuable. Anticipated attendee proﬁles include: corporate beneﬁt directors, third party administrators, brokers/ consultants, stop-loss insurance carriers/MGUs, captive managers and industry service providers. The Role of the Self-Insurance Industry in Advancing the Health Care Transparency Movement » Martin Makary, MD, MPH, Professor of Surgery at John Hopkins University School of Medicine, author of the widely-acclaimed Unaccountable: What Hospitals Won’t Tell You and How Transparency Can Revolutionize Health Care, shares his unique view on the state of the health care transparency movement and how the self-insurance industry in playing an increasingly important role in helping to disrupt the status quo for the benefit of patients and their employer plan sponsors. Employer Health Care Coalitions-Breaking the Grip of Health Insurance Monopolies One State at a Time » Karen van Caulil, Chairwoman of National Business Coalition on Health will highlight and describe how employer coalitions are re-shaping the health care marketplace in various states to help even the playing field for self-insurers when competing against insurance carriers for provider pricing and related arrangements. • Self-Insurance Industry ICD-10 Transition Update with Rick Raup, President & CEO of Business Administrators & Consultants, Bruce Carlson, FSA, Windsor Strategy Partners, LLC and Chris Haugan, Stop-Loss Supervisor of Employee Benefit Management Services, Inc. • The Evolution of TeleHealth Solutions for Self-Insured Plans with Dr. Jeffrey Kesler, President and COO of Salus The conference will conclude with a Legislative/Regulatory Update from Adam Brackemyre, Director of State Government Relations for SIIA and Ryan Work, Senior Director of Federal Government Relations for SIIA. In addition to the educational program, the event will feature multiple unique networking opportunities and multiple high profile companies exhibiting. ■ For more information visit www.siia.org.